KMC MTS Laboratory Attendant Admit Card 2019: The Kirori Mal College officials are planning to conduct the KMC MTS Laboratory Attendant Examination on 18th April 2019. Candidates who are willing to participate in the KMC MTS Laboratory Attendant Examination, they can download the KMC MTS Laboratory Attendant Hall Ticket 2019 from this page. The KMC MTS Laboratory Attendant Call Letter 2019 is a compulsory document for examination. So all the aspirants must attend for the examination with KMC MTS Lab Attendant Admit Card 2019. For the comfort of the candidates at the end of this page, we have given a link to download the KMC MTS Lab. Attendant Hall Ticket 2019. More details about KMC MTS Laboratory Attendant Admit Card 2019 mentioned in the below section. 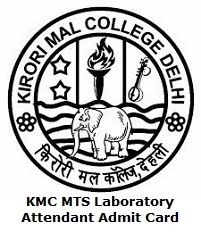 The Kirori Mal College officials going to conduct the KMC MTS Laboratory Attendant Examination on 18th April 2019 (Thursday) from 2:00 P.M. to 5:00 P.M at Kirori Mal College, University of Delhi, Delhi. The list of eligible candidates for appearing in the test will be notified by 17th April 2019. Till date, the officials didn’t declare any particular date about the KMC MTS Laboratory Attendant Admit Card Release Date. If any new update is there, then we will intimate you through this article. So all the aspirants keep an eye on Sarkari Recruitment to know instant updates about KMC MTS Lab Attendant Admit Card 2019. Kirori Mal College main page will open. Find the KMC MTS Lab Attendant Admit Card 2019 link in Latest @ KMC option. A page will open about login credentials information. Provided all important details in required fields and hit on submit button. We ensure the above provided information about KMC MTS Laboratory Attendant Admit Card 2019 is good enough for the candidates who had applied for KMC MTS Laboratory Attendant posts. We wish you all the best for your examination. To download the Hall Ticket, candidates just hit on the below given link. To know more details about all government job recruitments, syllabus, previous papers, admit card and result details just bookmark Sarkari Recruitment by using Ctrl+D. Thank you.